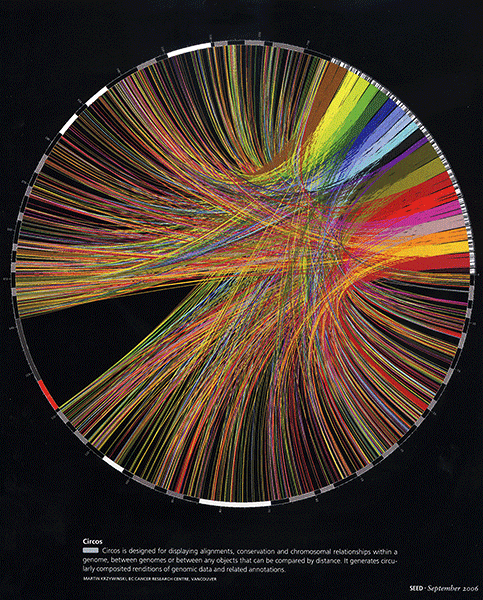 The July 2013 issue cover shows a Circos plot of relative copy number changes in 38 oral squamous cell carcinoma tumors. The September 2012 issue cover shows a collection of Circos images of somatic mutations in melanoma tumors. July 2013 Pickering CR, Zhang J, Yoo SY et al. 2013 Integrative genomic characterization of oral squamous cell carcinoma identifies frequent somatic drivers Cancer discovery 3:770-781. Sep 2012 Dahlman KB, Xia J, Hutchinson K et al. 2012 BRAF(L597) mutations in melanoma are associated with sensitivity to MEK inhibitors Cancer discovery 2:791-797. Saben et al. use Circos to visualize the transcriptome and gene expression of placenta from 20 healthy women in their article A comprehensive analysis of the human placenta transcriptome. Saben J, Zhong Y, McKelvey S et al. 2014 A comprehensive analysis of the human placenta transcriptome Placenta 35:125-131. The Fall 2013 issue of UCSF Magazine has my Circos illustration of personalized medicine. The human outline motif is incorporated into other design elements in the issue. The look of the image is inspired after Nature's Encode cover by Carl De Torres. To learn how to generate the cover and variants, read the Circos Encode Cover Tutorial. Yang et al. used network analysis approaches characterize a subtype of ovarian cancer associated with poor overall survival. E-cadherin is a protein encoded by the CDH1 gene and is responsible for cell-cell adhesion. Yang linked the expression of E-cadherin to specific miRNAs that influenced the regulatory network singled out in this cancer subtype. Because of its large 8 Gb genome, the genomic analysis of rye has lagged behind other cereals. To address this, Martis et al. eastablished a linear gene order model for 72% of the rye genes based on synteny information from rice, sorghum and B. distachyon. Although it appears that six major translocations shaped the modern rye genome, highly dissimilar conserved syntenic gene content, gene sequence diversity signatures, and phylogenetic networks were found for individual rye syntenic blocks. Bollongino et al. present evidence of a slow transition between Mesolithic hunter-gatherer groups to Neolithic farmers. Previous theories that the foragers disappeared shortly after the arrival of farmers are at odds with palaeogenetic and isotopic data analysis from Neolithic human skeletons from the Blätterhöhle burial site in Germany. Instead of an abrupt transition, the data suggest a more complex pattern of coexistence that persisted for over 2000 years. Bollongino R, Nehlich O, Richards MP et al. 2013 2000 years of parallel societies in Stone Age Central Europe Science 342:479-481. Ruddle et al. demonstrate their commodity hardware 54 million pixel data display in exploring copy number variation data. Ruddle RA, Fateen W, Treanor Det al.. 2013. Leveraging Wall-sized High-Resolution Displays for Comparative Genomics Analyses of Copy Number Variation. In IEEE Symposium on Biological Data Visualization, Atlanta, GA.
Kanemoto et al. report on the disturbing trend of emissions leakage, in which developing countries are displacing emissions intensive production offshore. The report confirms previous findings that adjusting for trade, developed countries emissions have increased, not decreased. A connection is made to the kind of emissions displacement that has already occurred for air pollution, where despite aggressive legislation in major emitters total global air pollution emissions have increased. The conclusion warns us that "if regulatory policies do not account for embodied imports, global emissions are likely to rise even if developed countries emitters enforce strong national emissions targets." The pleasing roundness of Circos is used by Ming et al. to depict the Sacred Lotus genome in the publication "Genome of the long-living sacred lotus (Nelumbo nucifera Gaertn.). The Sacred lotus has religious significance in both Buddhism and Hinduism and has been used as a food and herbal medicine product in Asia for over 7,000 years. Its seeds have exceptional longevity, remaining viable for as long as 1,300 years. The plant is known for its exceptional water repellency, known as the lotus effect. The latter property is due to the nanoscopic closely packed protuberances of its self-cleaning leaf surface, which have been adapted for the manufacture of a self-cleaning industrial paint, Lotusan. Ming R, Vanburen R, Liu Y et al. 2013 Genome of the long-living sacred lotus (Nelumbo nucifera Gaertn.) Genome Biol 14:R41. Rivers et a. describe the effects of the Deepwater Horizon blowout on the microbial blooms of petroleum-degrading bacteria. By sequencing 66 million community transcripts, the identity of metabolically active microbes and their roles in petroleum consumption was revealed. Circos frequently appears in plant literature, twice on the cover of Plant Biotechnology Journal in the last year. Circos has appeared 8 times each in the Plant Journal and Plant Cell. Slotte et al. use Circos to show the genomic structures, chromosome painting and comparative genomic mapping in C. rubella, A. lyrata and A. thaliana. Their figure illustrates how Circos is effective at showing two-way comparisons of syntenic structure. For three-way comparison, consider hive plots. The June 2013 issue of the Journal of Pathology features a pair of Circos plots on the cover. The images are from the paper by Weier et al. describing TMPRSS2 and ERG rearrangements in prostate cancer. "TMPRSS2–ERG rearrangements occur in approximately 50% of prostate cancers and therefore represent one of the most frequently observed structural rearrangements in all cancers." Weier C, Haffner MC, Mosbruger T et al. 2013 Nucleotide resolution analysis of TMPRSS2 and ERG rearrangements in prostate cancer J Pathol 230:174-183. The May 2013 Special Issue of Asian Journal of Andrology presents the outcomes from the Sixth Annual Forum on Prostate Disease (6th FPD), which was held on June 8-9, 2012 in Shanghai, China [source: nature.com]. The cover art for the issue shows a Circos plot of 90 significantly recurrent molecular alterations in prostate cancer from an analysis of 372 prostate tumors discussed in the Wyatt et al. review article. The review summarizes the current state of understanding of prostate cancer, "including the sentinel role of copy number variation, the growing spectrum of oncogenic fusion genes, the potential influence of chromothripsis, and breakthroughs in defining mutation-associated subtypes. Increasing evidence suggests that genomic lesions frequently converge on specific cellular functions and signalling pathways, yet recurrent gene aberration appears rare". Wyatt AW, Mo F, Wang Y et al. 2013 The diverse heterogeneity of molecular alterations in prostate cancer identified through next-generation sequencing Asian J Androl 15:301-308. Pardoe et al. find that "Sodium valproate use in epilepsy is associated with parietal lobe thinning, reduced total brain volume, and reduced white matter volume." The cover image shows antiepileptic drug combinations in intractable focal epilepsy cases. Linked drugs were being taken concurrently by an individual. Valproate cases are highlighted in orange. Pardoe, HR, Berg, AT, and Jackson, GD 2013Sodium valproate use is associated with reduced parietal lobe thickness and brain volume Neurology 80(20):1895-1900. Rijlaarsdam et al. describe an algorithm for improving miR-mRNA predictions. "Algorithms predicting miR-mRNA interactions generate high numbers of possible interactions, many of which might be non-existent or irrelevant in a certain biological context. It is desirable to develop a transparent, user-friendly, unbiased tool to enrich miR-mRNA predictions." The rise of cheap and rapid genome sequencing has allowed for individual cancer genomes to be sequenced and compared to the reference human sequence. This comparison includes enumerating structural differences, as well as spatial characteristics across the genome, such as gene expression and methylation levels. Circos is currently one of the standard methods to visualize these data. ▴ Nature Reviews Cancer article End-joining, translocations and cancer by Bunting and Nussenzweig discuss the mechnisms behind genomic rearrangements and show how Circos can help visualize them. ▴ Nature features an article by Heidi Ledford, The Cancer Genome Challenge, which reports on the progress and challenges of identifying structural variation signatures in cancer genomes. In genomics, scientific journals like Science, Nature, PLoS, Genome Research and others have published papers that used Circos images (scientific citations).